To Cite: Rashidi Nezhad R, Meybodi S M, Rezaee R, Goudarzi M, Fazeli M. Molecular Characterization and Resistance Profile of Methicillin Resistant Staphylococcus aureus Strains Isolated from Hospitalized Patients in Intensive Care Unit, Tehran-Iran, Jundishapur J Microbiol. 2017 ; 10(3):e41666. doi: 10.5812/jjm.41666. Background: Staphylococcus aureus is an important opportunistic pathogen and can cause a wide range of infections. The ability of this pathogen to successfully persist within the hospital and the community is largely due to its remarkable ability to acquire resistance against various antimicrobial agents. Objectives: The aim of this study was to determine the carriage of antibacterial resistance genes and virulence markers of S. aureus isolates from hospitalized patients in intensive care units in Tehran, the capital of Iran. Methods: In this cross-sectional study that was conducted during an 11-month period since March 2015 to January 2016, a total of 105 S. aureus strains were investigated. MRSA screening was performed by phenotypic and genotypic methods. The Kirby-Bauer disk diffusion method was used to assess the sensitivity of S. aureus strains. The strains were typed based on the polymorphisms in SCCmec types. 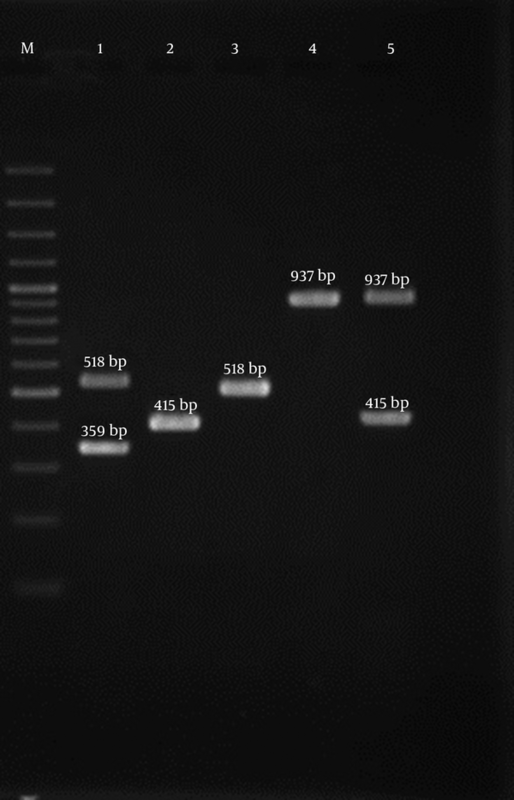 The presence of resistance (ermA, ermB, ermC, mupA, msrA, msrB, tetM, ant (4΄)-Ia, aac (6΄)-Ie/aph (2˝), aph (3΄)-IIIa) and toxin (etb, eta, pvl, tst) encoding genes were investigated by the polymerase chain reaction (PCR) technique. Results: In this study, 105 isolates of S. aureus were obtained from 299 various clinical specimens. Ninety five (90.5%) strains were confirmed as methicillin-resistant S. aureus. The lowest levels of resistance were related to quinupristin-dalfopristin (16.8%) while the highest levels of resistance were related to penicillin (94.7%). Multi-drug resistance was observed in 91.5% of the isolates. Type IV was the most prevalent SCCmec type (57.9%), followed by type III (22.1), type V (12.6%), I (5.3%), and II (2.1%). Overall, 25 isolates (26.3%) harbored PVL-encoding genes, and all of them belonged to SCCmec type IV. The presence of resistance genes ant(4΄)-Ia, aac(6΄)-Ie/aph(2˝), aph(3΄)-IIIa, ermA, ermB, ermC, msrA, msrB, and tetM was detected in 94.7%, 81.1%, 31.6%, 31.6%, 15.9%, 18.9%, 47.3%, 21.1%, 56.8%. The frequency of the etb, eta, and tst genes were 1.1%, 4.2%, and 32.6%, respectively. Conclusions: The results illustrated the diversity of antibacterial resistance and virulence gene profiles among different SCCmec types of S. aureus. The increased prevalence of methicillin-resistant S. aureus isolates containing different toxin and antibiotic resistance genes is a serious threat for the hospitalized patients in the intensive care units. Staphylococcus aureus is the major cause of infection in either hospitals or within the communities across the world (1). During the past several decades, in spite of introducing a variety of therapeutic measures including antibiotic therapy, Methicillin-resistant S. aureus (MRSA) strains have shown a remarkable ability in a rapid development of multi-drug resistance (MDR) (2, 3). The ability of this pathogen to successfully persist within the hospitals and communities is largely due to its remarkable ability to acquire resistance particularly against methicillin, the further complicating treatment of infections. Methicillin resistance is mediated by mecA gene, that is transferred by the staphylococcal cassette chromosome mec (SCCmec) as a mobile genetic element with the size of 21 - 67 kbp (4). Eleven different SCCmec (I-XI) types have been characterized based on the nature of the mec and ccr gene complexes (4). The study of the distribution of the SCCmec element of S. aureus is essential for the molecular typing of MRSA strains (1). Aminoglycosides are one of the most antibiotics used to treat infections caused by S. aureus especially MRSA strains. The main mechanism of the resistance to aminoglycosides is the inactivation of antibiotics by aminoglycoside-modifying enzymes (AMEs) (5, 6). Methicillin-resistant S. aureus strains have shown a wide pattern of resistance not only to β-lactams and aminoglycosides, but also to other therapeutic options such as macrolides, lincosamides, and mupirocin (2, 3). The macrolide antibiotics as protein synthesis inhibitors are widely used in the treatment of staphylococcal infections. The different mechanisms of resistance to macrolides include: a) ribosomal binding site modification encoded by erm genes (ermA, ermB, and ermC), b) active efflux mechanism encoded by msr gene (7). Mupirocin, also known as pseudomonic acid A, is a topical narrow spectrum antibiotic that is used for eradicating MRSA colonization and, also, the treatment of different types of staphylococcal skin infections. Mupirocin is an analogue of isoleucine that binds to isoleucyl-tRNA synthetase and blocks protein synthesis. Mupirocin resistance is classified in two categories: a) high-level mupirocin resistance that is encoded by plasmid-borne mupA genes, b) low level mupirocin resistance (mupL) that is encoded by the genes located on the bacterial chromosome (8). Nowadays, in spite of the introduction of newer antibiotics, due to the emergence and spread of various types of antibacterial resistance genes, the treatment of infections caused by MRSA strains has become problematic (3). The most commonly detected antibiotic resistance genes in clinical S. aureus strains are mecA (methicillin), ermA, ermB and ermC (macrolide, lincosamide, streptogramin B), mupA (mupirocin), msrA and msrB (macrolides), tet (tetracycline), ant(4΄)-Ia, aac(6΄)-Ie/aph(2˝), and aph(3΄)-IIIa (AMEs, aminoglycoside modifying enzymes) (9-14). MRSA strains are usually resistant to many antibiotics and may carry virulence factors that have a significant role in the pathogenicity of the diseases such as panton-valentine leukocidin (PVL), toxic shock syndrome toxin-1 (TST-1), and exfoliative toxins (eta, etb) (9, 15, 16). Given the increasing occurrence of MRSA infections in different wards of the hospitals, especially in the intensive care unit (ICU) wards, the purpose of the present research was to determine the prevalence of MRSA, antibacterial susceptibility pattern, and the carriage of resistance and virulence determinants in various types of clinical samples recovered from ICUs. The 105 S. aureus strains analyzed in this cross-sectional study were obtained from hospitalized patients in the ICUs of seven hospitals in Tehran, Iran since March 2015 to January 2016. These isolates were recovered from different clinical samples like wound (n = 45; 42.9%), blood (n = 30; 28.6%), ear (n = 12; 11.4%), pus (n = 8; 7.6%), body fluids (n = 5; 4.8%), catheter (n = 3; 2.8%), and urine (n = 2; 1.9%). The research was approved by the ethics committee of Shahid Beheshti University of Medical Sciences, Tehran, Iran (Code # 143). All patients provided written informed consent for this study. Samples were transported to the laboratory within 4 hours of collection and were processed immediately. All the strains were identified by standard microbiological procedures such as colony morphology, Gram staining, growth on mannitol salt agar and production of catalase, coagulase, and DNase. All the isolates were confirmed using polymerase chain reaction (PCR) for the femA and nucA genes (10, 11). S. aureus isolates were stored in Tryptic Soy Broth (TSB; Merck, Germany) containing 20% glycerol at -70°C for further investigations. Susceptibility to kanamycin (K 30 µg), ciprofloxacin (CIP 5µg), clindamycin (CD 2 µg), tetracyclin (T 30 µg), erythromycin (E 15 µg), linezolid (LZD 30 µg), penicillin (PG 10 µg), teicoplanin (TEC 30 µg), quinupristin-dalfopristin (SYN 15 µg), amikacin (AK 30 µg), tobramycin (TN 10 µg), gentamicin (GM 10 µg), trimethoprim-sulfamethoxazole (TS 2.5 µg), and ceftriaxon (CRO 30 µg) was determined using the Kirby-Bauer disk diffusion technique in accordance with the clinical and laboratory standards institute (CLSI) (17). The minimum inhibitory concentration (MIC) for vancomycin and mupirocin was determined with E-test strips (bioMe’rieux) according to the manufacturer’s instructions. According to the CLSI guidelines, the high-level mupirocin-resistant isolates showed an MIC greater than 512 μg/mL. Inducible clindamycin resistance was detected by broth micro-dilution method according to the CLSI procedure. Briefly, the organism was regarded as positive for inducible clindamycin resistance and/or inducible macrolide, lincosamide, streptogramin (iMLSB) phenotype when growth was observed in a well containing 4 μg/mL erythromycin and 0.5 μg/mL clindamycin. If growth was not observed, no inducible clindamycin resistance and/or constitutive MLSB (cMLSB) phenotype was reported. Overall, inducible resistance to clindamycin was defined for the isolates that were susceptible to clindamycin and resistant against erythromycin, while constitutive resistance was defined for the isolates that were resistant to both erythromycin and clindamycin (17). Multidrug resistance (MDR) was defined as resistance to three or more unique antibiotic classes in addition to beta-lactams (1). All the antibiotic disks used in this research were supplied by Mast, UK. S. aureus ATCC25923 and ATCC29213 were used as quality control strains in the antibacterial susceptibility testing. The DNA of the strains was extracted using the commercial kit InstaGene Matrix (BioRad, Hercules co., CA, USA) along with the addition of lysostaphin (Sigma-Aldrich co., USA) to a final concentration of 15 µg/mL. Methicillin-resistant S. aureus isolates were screened with cefoxitin disc (30 µg) and oxacillin disc (1 µg) on Mueller Hinton agar plates supplemented with 4% NaCl in accordance with the CLSI guidelines (17). Isolates with phenotypic resistance to oxacillin were confirmed to harbor the mecA gene by PCR (15). PCR was performed to determine the presence of resistance (ermA, ermB, ermC, mupA, msrA, msrB, tetM, ant (4΄)-Ia, aac (6΄)-Ie/aph (2˝), aph (3΄)-IIIa) and toxin (etb, eta, pvl, tst) encoding genes. The primer sequences are presented in Table 1. Different SCCmec types were characterized by specific primers described by Boye et al. (4). SCCmec types were identified by comparing the banding patterns of MRSA to ATCC 10442 (SCCmec type I), N315 (SCCmec type II), 85/2082 (SCCmec type III), MW2 (SCCmec type IVa), and WIS (SCCmec type V) as reference strains. PCR amplification was performed in a final volume of 50 µL via EmeraldAmp MAX PCR Master Mix (Takara, Japan) for all PCR reactions. PCR conditions for the amplification of the SCCmec elements by thermocycler (Eppendorf co., Hamburg, Germany) were as follows: Initial denaturation for 5 minutes at 94°C, 35 cycles of denaturation at 94°C for 40 seconds, annealing at 56°C for 45 seconds, and extension at 72°C for 1 minute. The final extension was carried out at 72°C for 4 minutes. Amplified products were analyzed by electrophoresis on 1% agarose gel via ethidium bromide staining. Ultimately, the products were examined under ultraviolet illumination. In this study, 105 isolates of S. aureus were obtained from 299 various clinical specimens. Out of the 105 tested isolates, 95 (90.5%) isolates were confirmed as MRSA strains. Wound infections (47.3%) were the most prevalent infections among our samples, followed by blood infections (28.4%) and pus infections (8.4%). The results of the antibiotic susceptibility testing showed that all the strains were inhibited by vancomycin at similar MIC50 and MIC90 1 µg/mL. The susceptibility of MRSA strains to the commonly used antibacterial agents is shown in Table 2. Out of the 29 MRSA isolates that were found mupirocin resistant, 12 (41.4%) isolates were detected as MRSA isolates with high-level mupirocin resistance and carried the mupA gene. All the MRSA strains carrying the mupA gene were isolated from wound infections. In the present study, 67 (70.5%) MRSA isolates expressed resistance to erythromycin. Also, iMLSB was detected in 12 (12.6%), cMLSB in 50 (52.6%), and MLSB in 5 (5.3%) isolates. The prevalence of MDR-MRSA isolates in the present study was estimated to be 91.5%. Generally, five different antibiotic resistance patterns were identified among the MRSA strains. The distribution of different resistance patterns among the MRSA isolated from the clinical samples of the hospitalized patients in ICU is presented in Table 3. Abbreviations: AK, amikacin; B, Blood; BF, Body fluide; C, Catheter; CD, clindamycin; CIP, ciprofloxacin; CRO, ceftriaxone; E, erythromycin; E, ear; GM, gentamicin; ICU, intensive care unit; K, kanamycin; MUP, mupirocin; P, Pus; PG, penicillin; SYN, quinupristin-dalfopristin; T, tetracyclin; TN, tobramycin; TS, trimethoprim- sulfamethoxazole;W, wound; U, urine. Multiplex-PCR analysis for the detection of different SCCmec types revealed that type IV was the most predominant (57.9%) SCCmec type followed by type III (22.1), type V (12.6%), I (5.3%), and II (2.1%) (Figure 1). Twenty five isolates (26.3%) were positive for PVL-encoding genes which belonged to SCCmec type IV. It is noteworthy that PVL genes were detected in 37% and 33% of blood and wound infections, respectively, while they were not detected in other remaining infections. Out of the 95 MRSA isolates analyzed in the current study, 31 (32.6%) isolates harbored tst-1 encoding gene that was detected in 40%, 37.5%, 33.3% and 33.3% of wound, pus, blood, and catheter samples, respectively. The eta gene was only found in one MRSA isolated from wound infections that was assigned to SCCmec type IV. Two (4.2%) isolates harbored etb gene, which belonged to SCCmec type III. The distribution of different SCCmec types and toxin encoding genes among MRSA isolates obtained from various clinical sources is summarized in Table 4. Figure 1. Lane M, 100-bp DNA Ladder (Fermentas, UK); Lane 1 SCCmec Type V; Lane 2 SCCmec Type I; Lane 3 SCCmec Type III; Lane 4 SCCmec Type II; Lane 5 SCCmec Type IV. The analysis of the antibiotic resistance genes by PCR revealed that ant(4΄)-Ia gene had the highest frequency and mupA gene had the lowest frequency in the present study (Figure 2). The majority of the isolates carrying the ant(4΄)-Ia gene (77.8%) were also resistant to kanamycin. The MRSA strains of the wound and blood infections had the highest prevalence of antibiotic resistance genes. The distribution of the resistance genes among 95 MRSA strains isolated from the hospitalized patients in ICUs is presented in Table 5. Figure 2. Lane M, 100-bp DNA Ladder (Fermentas, UK); Lane 1 luk-PV Gene, Lane 2 tst Gene, Lane 3 eta Gene, Lane 4 etb Gene, Lane 5 ant(4΄)-Ia Gene, Lane 6 aac(6΄)-Ie/aph(2˝) Gene, Lane 7 aph(3΄)-IIIa Gene, Lane 8 ermA Gene, Lane 9 ermB Gene, Lane 10 ermC, Lane 11 msrA Gene, Lane 12 msrB Gene, Lane 13 mupA Gene, and Lane 14 tetM Gene. All the 12 strains with the iMLSB phenotype (12.6%) carried ermA, ermB, msrA genes, while ermC and msrB were detected among two (16.7%) and five (41.7%) isolates. Out of 50 (52.6%) strains with the cMLSB phenotype, ermA, ermC, msrA, and msrB were found in 11 (22%), 16 (32%), 33 (66%), and 15 (30%) isolates, respectively. Out of five isolates with MLSB phenotype, two (2.1%) isolates carried ermA and one isolate (1.1%) carried ermB. Two (2.1%) isolates with MLSB phenotype were negative for these genes. None of the isolates with MLSB phenotype carried msrA and msrB genes. The most common resistance genes among iMLSB and cMLSB phenotypes were ermA, ermB, msrA genes (100%) and msrA (66%). The results of the aminoglycoside-resistant genes screening showed ant(4΄)-Ia as the most prevalent resistance gene found among 90 (94.7%) strains. A total of 55 (57.9%) isolates harbored the ant(4΄)-Ia and aac(6΄)-Ie/aph(2˝), 20 (21.1%) isolates ant(4΄)-Ia,aph(3΄)-IIIa, and aac(6΄)-Ie/aph(2˝), 6 (6.3%) isolates ant(4΄)-Ia, aph(3΄)-IIIa, 2 (2.1%) isolates aph(3΄)-IIIa, and aac(6΄)-Ie/aph(2˝) simultaneously. The ant(4΄)-Ia gene was detected alone in seven isolates (7.3%). The widespread emergence of MDR S. aureus is becoming a great challenge in the public health (1). According to the literature, there is heterogeneity in the prevalence of MRSA in different regions and countries (1, 16). In this study, methicillin resistance was detected in 90.5% S. aureus isolates. The high frequency of MRSA isolates in the present study was in agreement with the findings of the studies in Iran (1), Bolivia (18), and India (19) and is higher than Hungary (20) and Croatia (21). The results of the susceptibility testing showed that all the isolates were susceptible to vancomycin, linezolid, and teicoplanin which is consistent with a previous study in Iran (1) and other studies (16-21). Although aminoglycosides play an important role in the therapy of serious staphylococcal infections, there have, recently, been reports of increased resistance to this drug worldwide. The results of this study revealed a relatively high level resistance to aminoglycosides such as kanamycin (82.1%), gentamicin (72.6%), tobramycin (69.5%), and amikacin (59%). This finding is similar to the other observations reported from 12 Asian countries by Ko et al. (22). Also, a study conducted in Iran (1) exhibited relatively similar resistance to amikacin (64.3%), gentamicin (60%), kanamycin (57.1%), and tobramycin (57.1%) in comparison with our study. The ant(4΄)-Ia gene was determined in 94.7% of the MRSA isolates. These results are inconsistent with a previous study by Rahimi et al. which reported that the prevalence of aac(6′)/aph(2′′) gene was higher than that of the two other AME genes, ant(4′)-Ia and aph(3′)-IIIa in MRSA isolates (23). Furthermore, the frequency rate of the ant(4’)-Ia gene was higher than in the previous study performed in Iran (23) (42.2%), Japan (84.5%) (24) and Turkey (24%) (10). The rate of aph(3΄)-IIIa gene in this study was 31.6%, which is in accordance with the results of a study in Iran by Rahimi (23), and was higher than Japan (8.9%) (24) and lower than Turkey (66%) (10). In the present study, all the MRSA isolates resistant to gentamicin were positive for the aac(6′)/aph(2′′) gene, which is consistent with other reports (23, 25). The macrolide antibiotics as protein synthesis inhibitors are widely used in the treatment of staphylococcal infections (7). In the current survey, the ermA gene predominated in the strains with the inducible phenotype, while ermC was more common in the isolates with the constitutive phenotype, which is similar to the data reported by Ghanbari et al. (26). In this study, the frequency of the cMLSB phenotype was 50 (52.6%), iMLSB was 12 (12.6%), and MLSB was 5 (5.3%). In Turkey, the prevalence of iMLSB, cMLSB, and MSB phenotypes among MRSA strains was 18%, 23%, and 48%, respectively (27). In another study conducted by Lavallee et al. (28) in Canada, inducible clindamycin resistance was detected in 64.7% MRSA isolates and 35.3% of these isolates showed constitutive MLSB phenotype. The rate of the iMLSB phenotype in the present study is higher than those reported by Ghanbari et al. (26) (4.18%), and Schreckenberger et al. (7%) (29). In a study conducted by Fiebelkorn et al. (30) 34% of 114 erytromycin resistant S. aureus isolates demonstrated constitutive resistance to clindamycin and 29% showed inducible resistance. Overall, the occurrence of the iMLSB resistance phenotype varies widely in geographic regions (29). In this survey, the frequency of cMLSB phenotype was higher than iMLSB phenotype, which is in accordance with the results obtained by Ghanbari et al. (26). In the present study, of 29 isolates (30.5%) that presented mupirocin resistance phenotype, of which 41.4% harbored the mupA gene as confirmed as high-level mupirocin resistant MRSA that is lower than the previous rate reported by Abbasi-Montazeri et al. (31) from the south-west of Iran (34%) and is higher than India (5%) (32), and Greece (1.6%) (8). In this survey, the resistance of the isolates was confirmed by the amplification of mupA. In a study conducted by Shahsavan et al. (33), it was shown that 25% of mupirucin resistant MRSA isolates carried the mupA gene. Unrestricted policies that allow the improper and widespread use of mupirocin for long periods in hospitals and health care settings and the origin of the isolates and clinical samples are the most important causes of variation in the incidence rate of resistance to mupirocin in MRSA isolates (8, 32, 33). The tetM was the second most detected antibiotic resistance gene in the MRSA strains among the clinical isolates in this study. This observation is in agreement with Dormanesh et al.’s (34) study. They showed that the most commonly detected antibiotic resistance genes in the MRSA strains were tetK (89.18%), mecA (71.62%), msrA (56.75%), and tetM (54.05%). In accordance with the results of the studies in Italy (35), Croatia (21), and Hungary (20), a high resistance to ciprofloxacin was seen in the current study (63.2%), which could be due to the widespread use of ciprofloxacin in the treatment of MRSA infections, mutation in gyrase or topoisomerase IV enzymes, and efflux pumps (36). The most frequent toxin gene in this survey was tst (32.6%) that was recovered from blood (33.3%), pus (37.5%), and wound (40%) samples. The results obtained in the current study are higher than those reported in Sweden 22% (37) and Colombia (10%) (38) and lower than a study conducted in Iran 51.4% (1). In line with a study which reported the prevalence of 2% - 35% of PVL genes among MRSA strains (39), 25 isolates (26.3%) obtained from blood (37%) and wound (33.3%) which belonged to SCCmec type IV were positive for the PVL-encoding genes. The frequency of the eta gene in this study was 1.1%. The frequency rates of eta gene reported from Colombia (38) and Malaysia (40) were 3% and 0%, respectively. The range from 0% in Colombia (38) and Malaysia (40) to 9.2% in Turkey (41) for the etb gene frequency was reported. The frequency of the etb in this study was 4.2%, which is in accordance with Eftekhar et al. study from Iran (42). SCCmec types I, II, III are related to hospital-associated MRSA (HA-MRSA) while the SCCmec types IV and V are prominent types of community-associated MRSA (CA-MRSA) (1). The distribution of SCCmec types among the MRSA strains indicated the high frequency of SCCmec type IV (57.9%) in the present study, all of which were PVL positive. This finding was inconsistent with the previous reports about the predominance of SCCmec III in most Asian countries (22). In this study, the resistance to antibacterial agents and MDR pattern among isolates with SCCmec type III was more prevalent than that of SCCmec type IV, while the distribution of the virulence factors were vice versa, which is in line with the findings of other studies (16, 21). In conclusion, the results of this study illustrated that the SCCmec type IV was predominant among ICU patients. The higher frequency of some antibiotic resistance genes in this study which could be a challenge for the public health, emphasizes that infection control measures should be prioritized in the ICUs of our hospitals. This study was performed as part of a master thesis of Ramin Rashidi, and was supported financially by a research grant from Infectious diseases and tropical medicine research center, Shahid Beheshti University of Medical Sciences (Grant No. 9999). We, also, thank the individuals and organizations who participated in this research. Authors’ Contribution: Mehdi Goudarzi and Seyed Mansour Meybodi: study concept and design, the development of the study, data interpretation, and manuscript revision; Ramin Rashidi, Mehdi Goudarzi and Seyed Mansour Meybodi: phenotypic and molecular studies and manuscript drafting; Ramin Rashidi, Mehdi Goudarzi and Maryam Fazeli: performing experimental procedures; Ramin Rashidi and Maryam Fazeli: participation in the acquisition of data and statistical analysis; Mehdi Goudarzi and Seyed Mansour Meybodi: Study supervision. All the authors read and approved the final manuscript. Financial Disclosure: There was no financial disclosure to report. Funding/Support: This work was supported by a research grant from Infectious Diseases and Tropical Medicine Research Center, Shahid Beheshti University of Medical Sciences (Grant No. 9999).